Sending a Happy​ New Month message to your loved one(s) is one of the most affectionate things you can ever do. I have text messages here for you to spoil them. Express the infinite affection you have for them with these messages for the Month of April 2019. 1. Yaayy! It’s a new month! Another opportunity to grow deeper in love and excel in all our endeavours. Happy New month dear. 2. New months come with lots of desirable pleasures. 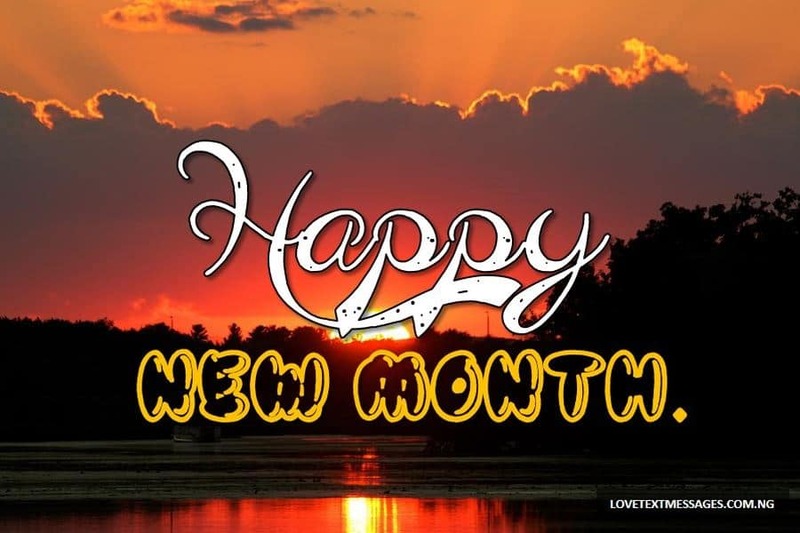 I pray that you will be loaded with countless blessings, this month. Happy new month, Sweetie. 3. It’s a great feeling to see this new month. It’s much more amazing that I’m doing so, with my love. Happy new month to us. 4. It’s a month of joy, peace and prosperity to you. May every occurrence this month turn out in your favour. Happy new month to my love. 5. I have just one wish, this month. I desire that our love gets stronger. Because I love you so much. Happy New month, Sugar. 6. It’s a new season. To season our love. To enjoy all the goodies of life. To make progress. That’s why I thought to say a happy new month to my flavour. 7. It’s a new month. New hope. New joy. To renew our commitment. And yes, our love life is taking a new shape. Happy new month, my love. 8. You prayed for strength and favour is added. You prayed for prosperity and joy is added. I prayed for love and I’m here for you. Totally yours to spend this month and beyond, together. Happy new month, darling. 9. I have three wishes this month. The grace to show you love in an amazing way. To do is much better. And to be my best for you. Happy new month, babe. 10. Love is like a plant. As we enter this month, may our love grow magnificently and produce more sweetness. Happy new month, Love. 11. Start arranging a welcome party. Because, every good thing you ever prayed for, are coming to you in seven folds, this month. Cheers to a great month. 12. Like the new month come without stress, my love for you wax stronger effortlessly. Baby, I love you deeply, beyond words. Happy new, dear. 13. I’m sorry to announce you that the love I had for you has vanished with last month. Surprised? Yes! It’s a fresh new love and strong affection I have for you now. Happy new month, Heartbeat. 14. Let us pray. May your life be preserved. May you smash your daily. goals. May this month be your best month so far. Happy new month, Dearest. 15. Let go of the ups and downs of the previous months. Let’s hope for the best because light has come! I wish you an amazing month, my Lovesome. 16. I pray your joy will be full. I pray you’ll be full of victory songs. And know that my heart sings and beautiful rhythm of your name. Happy new month, My Angel. 17. New month, new day, new sunrise to shine favour upon you and bring you lots of happiness. Happy New month, my Sunshine. 18. It’s a proper time to set new goals. Take a long breath and go smash every goal, knowing that I’ve got your back. Happy new month, my Superstar. 19. I pray that your work hours during the day, be so bright. That you record much success. I pray that your sleep hours be so sweet at night. That your dreams come true. Happy new month, Honey. 20. May this month be so bright for you, like the midday sun. And may it be as sweet as you. Happy new month. 21. A new month is another opportunity to tell you that I love you. I love you, from now till forever and a day. Happy new month, love. 22. The new month is here. It is a mark of a new beginning for you. Enjoy its fullness. Happy new month, my love. 23. 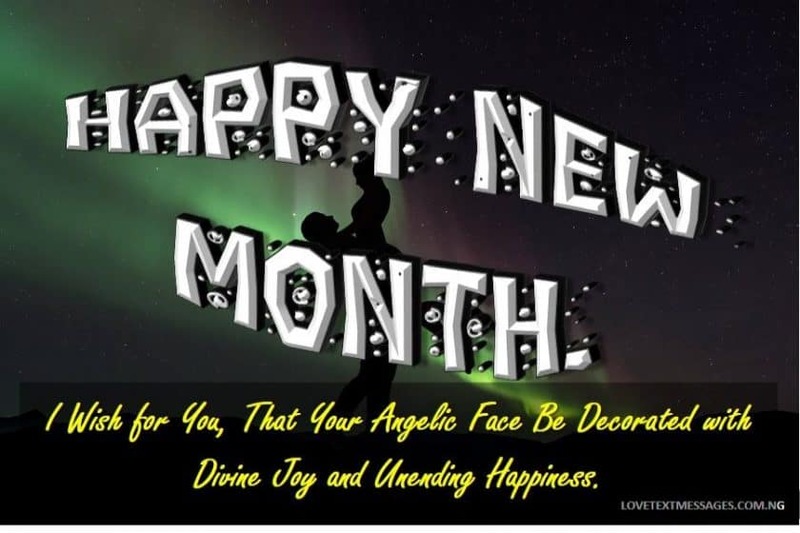 I wish for you, that your angelic face be decorated with divine joy, unending happiness, and a very happy new month. 24. It’s the start of a new month and I will like to wish you the very best of luck. Because you deserve only the best, in life. Happy new month. 25. Be reminded, you’re meant for the top only. Just because you’re the topmost person in my heart. Shine brighter than diamond dear. Happy new month. 26. You make me smile and hug me tight. You keep me going and I’m so happy to have you. Happy new month, Cupcake. 27. You’re my jewel of inestimable value. And this month is another opportunity to prove it. Happy new month, my amazing angel. 28. Loving you is my job. And in this new month, I’m going to do it with all of my heart. Happy new month, sweetheart. 29. Your kind gestures bring joy to my heart every day. I love you for all you do. Have an amazing day, every day of this month. 30. I think I’ve not told you in a while, that you’re my fantasy come true. I can’t get enough of you. You’re cutely amazing. Happy new month. 31. You can never know how much I think about you and how much more I’ll esteem you highly. Keep your fingers crossed. Let me wish you a happy new month first. Kisses. 32. Every single moment we’ve spent together has been nothing less than euphoric. Let’s do more this new month, honey. 33. No sad day with you. No gloomy with you. It can only be a super amazing month with each other. Happy new month, my love. 34. It might not be perfectly smooth but it will definitely be an amazing month. Happy new month, my love. 35. Because nothing can prevent the sun from shining, you’re unstoppable. Go ahead and make giant strides. A happy new month from me to you. 36. Many things might be staring you in the face. But look within, you have a thousand and one reasons to succeed. Cheers to a victorious month, dear. 37. The world awaits you, and I’m more than eager to celebrate your success this month, honey. To you a better you, this month. 38. I can see more opportunities ahead of you. Prepare to grab every single one. Happy new month, my hero. 39. You have Unique a way of doing things in a superb and sweet manner. You make me happier every day and every new month is an opportunity to love you deeper. Happy new month, love. 40. This month, I pledge to love you more deeply. To be there for you, more nearly. To touch your heart more dearly. Happy new month. 41. My love for you pumps up spontaneously, the same manner new months come. It’s so effortless and I can’t explain how it happens. Happy new month, my heart. 42. Each thoughtfulness of yours makes our love sweeter. Each lovely step you take makes us bond better. Hence, I know we can only get better. Happy new month, love. 43. I know you love boundlessly and infinitely. Can we repeat this, as we launch to greater heights, this month? Happy new month, my desire. 44. I can’t stop loving you and I know that our love will transpire into something much more magical, this month. Happy new month, my soulmate. 45. It’s always been difficult to communicate the extent to which I love you. I don’t think it will get any easier this month. Because I love you crazily​. Happy new month dear. 46. I look forward to another endless cycle of glee and​ grace, with you. Because our love is forever. Happy new month, love. 47. Because you’re all I ever want, I see each day of this month laced with gratitude to God, for bringing you my way. Happy new month, baby. 48. I know that I’m in for another round of thoughtful care. That’s why I’m seizing this opportunity to say thank you for all you do for me. Happy new month, love. 49. You love me genuinely, even with my beautiful imperfections. Saying​ “thank you”, every day of the month will never be enough. I love you today and every day of the new month. 50. Thanks for being there all the way. Thanks for being supportive in every step I take. This is me saying thank you today and forever. Happy new month love. 51. You’re a major blessing to me and I can’t stop thanking you. A new month I’ll be owing you more “thanks”. Happy new month, Honeypie. 52. Every day brings our hearts closer. This new month will make it even more magical. Things can only get better for us, baby. Happy new month. 53. I can’t stop loving up on you because you’re​ such a lovely soul. You’re my one and only. I’ll love you this month and all my life. 54. The way our love gets stronger each passing has made me come to say thank you for giving your best to make us better. Happy new month to a new us. 55. Everyone says that my life has taken the best mould. Just because I have a very romantic artist. You rock my world. Keep doing so. Happy New month, love. 56. Staying in love with you has been the best decision I made so far. Happy new month to the world’s best lover. 57. I’m excited about how far we’ve come and how much we’ve grown. Happy new month, my everyday crush. 58. Even if I’m unable to show up physically, every moment, I need you to know that my heart is involved with everything you do. I’ve got your back every moment. Happy new month, baby. 59. While I’m yet to finish computing all your kindness in the past months, another one rolled in! A million words will never be enough to thank you. Happy new month to my priceless Jewel. 60. You make me happy every day. I’m going to be yours this​ every day and every day of this month. Happy new month, Soulmate. 61. I’ve chosen to stay with you. Come what may, we’ll meet them together. I’m for you every day, a unique teammate. Happy new month, my superstar. 62. Your love is soothing. thoughtfulness is simply amazing. To you, my Greatest blessing, I say a happy new month. 63. While I’m still looking for words to describe how amazing you are, you’ve moved to the next level. Happy new, my love, keep prospering. 64. This month, No matter how busy you get, never forget that I’m somewhere thinking about you and can’t stop, not even for a second. Happy new month, my love. 65. Being with you is a forever decision. So, I count the months in heartbeats, because this heart will beat for only you forever. Happy new month, my heartbeat and lifetime friend. 66. I’ve taken my eyes off the past, the victories and the failures. I’ve set my eyes on the future and the opportunities it brings. It’s a new month and new month to forge ahead. Happy new month, my partners in success. 67. You made the previous months sweet and I’m excited about the new month because I have the most amazing lover. Happy new month, baby. 68. Nothing defines happiness other than your care, so I say a happy new month to the most amazing lover ever. Kisses. 69. Sometimes, I try to figure out what’s special about new months when you make me happy every day. Yet let me say a happy new month to the love of my life. Kisses. 70. This month, I want no other gift than your loving heart which you’ve always given. Happy new month, my love. 71. It’s a new month and new dawn on this matchless love of ours. I treasure you, baby. Happy new month. 72. You can enter into the new month with much boldness and lots of delight. You’re beautiful. Happy new month. 73. Why will I be afraid of any challenge when I have you with me. Happy new month, my superhero. 74. 30 days make one month, uncountable heartbeats make me fall in love with you over and over. Happy new month, love. 75. In every second that constitutes the month, my heart will always sing of your love. Happy new month to us. Happy month to our boundless love. 76. Let’s face every day of the new month with so much courage. I know we’ll win in every way. Happy new month to a greater us. 77. It’s a new day, a new month. I wish you the best in all your endeavours. May all your desires come true. Happy new month, dearie. 78. I wish that this month be as sweet as honey and as beautiful​ as you. You rock baby. Happy new month. 79. As from this month upward, you’ll always achieve the best results in everything you lay your hands upon. Happy new month, my dearest. 80. I pray that all your​ good desires come true by the power of the Almighty. Happy new month, my heart. 81. Nothing can take your place in my heart. Happy new month to my everyday crush. 82. As you’ve started this month in gratitude, you’ll always have things to thank God for. Happy new month, Mine. 83. New months come with new tasks, new aspirations, new opportunities. Go ahead and make waves. I believe in you, dear. Happy new month. 84. Every moment in the month, I pray for matchless strength for you. May this month be your best so far. Happy new month, baby. 85. Previous months, I enjoyed being loved by you. Your thoughtfulness and your care, are so sweet. I will not give up on our love. Promise me the same? Happy new month. 86. You’re so full of love. Your words, your message, your hugs and everything. You’ve intoxicated me and I don’t want it to stop, not this month, not ever. Happy new month, baby. 87. Looking at the stars remind me of the sparkles in your eyes. The sun tells of how you walked into my life and brightened me up. Happy New month baby. 88. New months are significant periods of our lives. To reflect on how much progress we’ve made. I wish you acceleration in all your endeavours. Happy new month, Honeypie. 89. I pray that only good things come to you this month because that’s what you deserve. Have you a month filled with surprises. Happy new month to us. 90. It’s a perfect time to set new targets and forge ahead. Let’s have a successful New month baby. 91. It will be a month of endless joy for us. It will be full of grace and favour for us. Jubilation will never cease with us. Happy new month to us. 92. There’s nothing more special than having a great Lover as you to spend the new month and beyond, with. You simply rock. Happy new month. 93. Thinking about your kindness and care, how always seek to make me happy. I pray that God will satisfy you with good things and fill your mouth with laughter. Happy new month Honeypie. 94. I pray that you will record more success this month, than ever. I pray that this month is filled with achievements for you. I pray that it brings a spark to our love life. Happy new month, love. 95. I desire that you face be always ornamented with smiles. Sadness will never come near you. Be happy for me, okay? I wish you a pleasant month. 96. I hope I’m the first to wish you a happy New month. Happy new month, from the heart that’s madly in love with you. 97. Soundness of mind and body is what I wish for my special baby today. Happy new month. I cherish you. 98. Every new month comes with the yearning to improve ourselves. I know we’ll grow together and stay together. Happy new month, beautiful. 99. No matter what happens this month, we’ll face it together, we’ll grow together. Happy new month to an indomitable us. 100. Sugar is sweet, honey is sweeter and there’s nothing sweeter than you. Happy new month, Sweetness. I cherish you.